The Pantelleria Trapani ferry route connects Pantelleria Island with Sicily. Currently there is just the 1 ferry company operating this ferry service, Liberty Lines Fast Ferries. The crossing operates up to 6 times each week with sailing durations from around 2 hours 10 minutes. Pantelleria Trapani sailing durations and frequency may vary from season to season so we’d advise doing a live check to get the most up to date information. Prices shown represent the average one way price paid by our customers. The most common booking on the Pantelleria Trapani route is a car and 1 passenger. The Italian island of Pantelleria lies in the Strait of Sicily, in the Mediterranean Sea. It is located around 60 km to the east of Tunisia and 100 km to the south west of Sicily. The island's terrain is made up of jagged lava stones, steaming fumaroles, dwarf vines and the Bagno dell'Aqua mud baths near Bugebar. The island is popular with scuba divers and snorkelers due to its clear waters and secluded coves, especially the north eastern part of the island which provides the best spots. Located a bit further down the coast visitors will find more scenic spots such as Cala di Tramontana and Cala di Levante. For visitors interested in history, the only archaeological site on the island is at Mursia where relics of sesi (ancient funerary monuments) are the only remaining evidence of a Bronze Age settlement. Unfortunately many of the tombs have been destroyed and the lava rock was used to build the famous dammusi which are houses with thick, whitewashed walls and shallow cupolas. 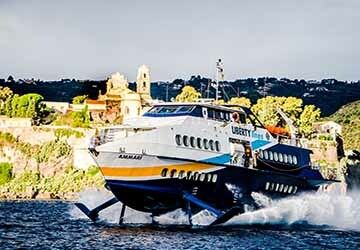 Ferries, for cars and passengers, from the island's port depart to Trapani (Sicily) and Hydrofoil, for passengers only, to Trapani and Mazara del Vallo. The Italian port city of Trapani is located in the west of Sicily and is sometimes known as the "City of the Two Seas". It is situated on a strip of land that reaches out to see with two prongs, and is dominated by the Tower of Ligny and by the Lazzaretto. The town was originally named Drepanon and was initially a market outpost of Erice which was later a Phoenician trading port. Following this, it became a Roman province but the most significant impact on the town was made by the three centuries of Arab rule. Around the city there are many sites of interest including the medieval walled hill town of Erice, Marsala, which is famous for its wine, and the ancient Greek site of Selinunte. One of the best places to visit, perhaps for a day or two, is the three island archipelago of the Egadi islands, which lie just off the coast. Two of the islands can be reached from Trapani in only half an hour.